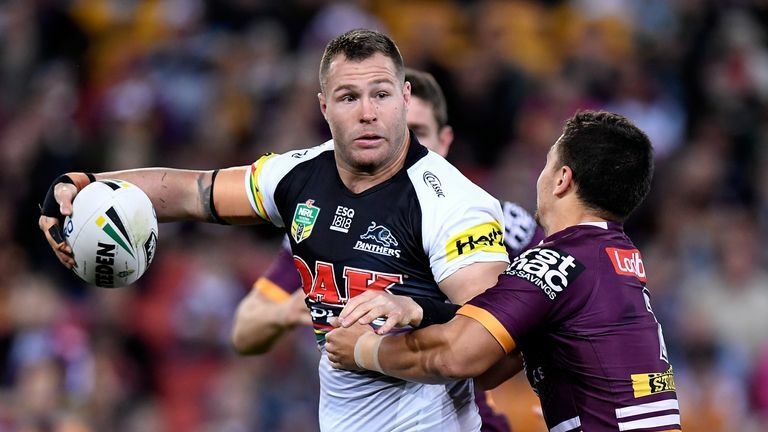 New Leeds Rhinos head coach Dave Furner has confirmed his interest in former Australia international forward Trent Merrin. Experienced NRL coach Furner, whose most recent role was assistant coach at South Sydney, has taken up a three-year contract with the Rhinos where he will be tasked with turning them back into a side capable of challenging for Super League glory. Their season will begin at Warrington on February 2 - where they will face a Wolves side who lost last season's Grand Final to Wigan - following Tuesday's 2019 Super League fixture announcement. Rhinos director of rugby Kevin Sinfield has said he hopes to announce a second marquee player, to add to recent signing Konrad Hurrell, and Furner dropped a big hint about who he expects that to be at the news conference where he was unveiled as head coach. Prop forward Merrin, who won seven caps for Australia from 2015-17, made 134 appearances for St George Illawarra before moving to Penrith three years ago and is set to leave the Panthers. "There is interest on both sides," Furner said. "No contract has been signed and he's still with Penrith at the moment but there have been talks. "We've got another quota spot and I'm looking at bringing in world-class players in if we can." Furner, who played 47 times for Leeds and was in the team that won the Grand Final in 2004, began his coaching career with Canberra, where he served as head coach from 2009-13. He had been linked the vacancy at Souths, which will now be filled by England head coach Wayne Bennett, but told the press conference he was always committed to succeeding Brian McDermott at Headingley. "There was no speculation for me," he said, "I rang Kev [Sinfield] and [chief executive] Gary [Hetherington] straight away to say, 'I'm guaranteed, I'm booked'. "I was fortunate enough to play here for four years, which was a privilege, and I remember finishing off with a Grand Final, so the decision wasn't a hard one. "I remember the atmosphere and fans and, coming back seeing the same faces, it's very strong for the club to have the same people involved. "It's a tremendous stadium, when it's finished it will be one of best in competition, that's something I noticed straight away." Sinfield, who played alongside Furner in 2003-04, says the Australian was on a three-man shortlist for the vacancy but was his top target. Leeds Rhinos have denied reports in Australia that incoming head coach Dave Furner will not be taking up the role. "When we decided we were going with a new head coach, we wrote a list of ideals and Dave ticked every box," said Sinfield. "He fully understands the club and the game over here. We wanted the best person for the job and we feel we got that." Sinfield also confirmed that 37-year-old forward Jamie Jones-Buchanan will play on in 2019. Leeds have also signed Tonga international stand-off Tui Lolohea for 2019 but Furner says he will retain the club's tradition of maintaining a pathway to Super League for the club's best youngsters.